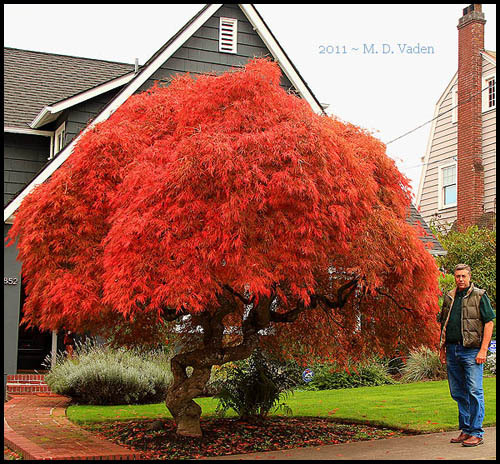 Here is a wide angle photo of a bigleaf maple tree in NE Portland. The maple burl is about 9 feet wide at ground level even though the maple is barely 25 feet tall. During the past year, a new section of trail has been under construction on the way down to Tall Trees Grove in Redwood National Park. Far too few people visit this grove. The permit limit is about 52 per day. And its probably rare when they ever issue that many per day. In late autumn and winter, just a handful of people hike down there. Some of the biggest coast redwoods are near the bottom near Redwood Creek in the flat. But one nice feature about this hike are the mixed species of trees including Douglas fir, Tanoak, Chinquapin and more. There is a refreshing grove of enormous Bigleaf Maples at the downstream end of the grove, with wide-reaching horizontal limbs. The photo shows a tunnel cut from a log in the new section of trail. One more photo of Del Norte Titan. Been a couple of years, but finally got another shot of Del Norte Titan in the Grove of Titans on a rainy day. I think this redwood looks best in a photo when there is mist and rain drops. 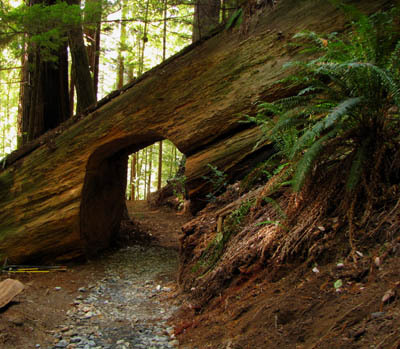 Here is a short introduction to the Grove of Titans in Jedediah Smith Redwoods State Park. 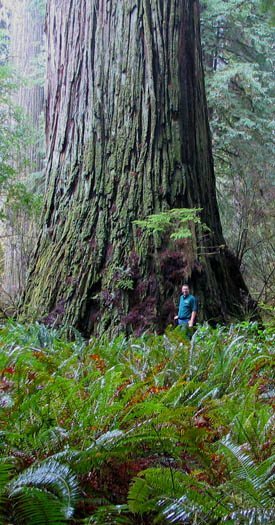 Maybe you are already familiar with these giant redwoods from an article, or maybe Preston’s book called “The Wild Trees”. The photo to the right is Del Norte Titan, one of those big redwoods. To spare space here, you can find reams more info about these from my Redwoods information page. Several redwoods have a separate page. Look for Lost Monarch, Del Norte Titan and Screaming Titans. For now, I’m not planning to distribute a map. A few folks have found the grove, but any wear was inconsequential, even reversing in 2009. Just finished a big transition in our back yard a couple of weeks ago. We still have a few small trees to plant, and the vegetable garden in the corner to work on. But it’s 80% complete now. We replaced lawn with decorative rock and a paver patio, plus hemlock bark. The building is a detatched guest room we put up last autumn. Its on blocks to spare the Douglas fir tree roots. The tree is behind it, about 7′ behind. Edit > August 2010, we decided on some lawn afterall. Worked out nicely, allowing the backfill soil at the wall to settle with late spring rains. Is ancient redwood tissue and antique glass technically a liquid? 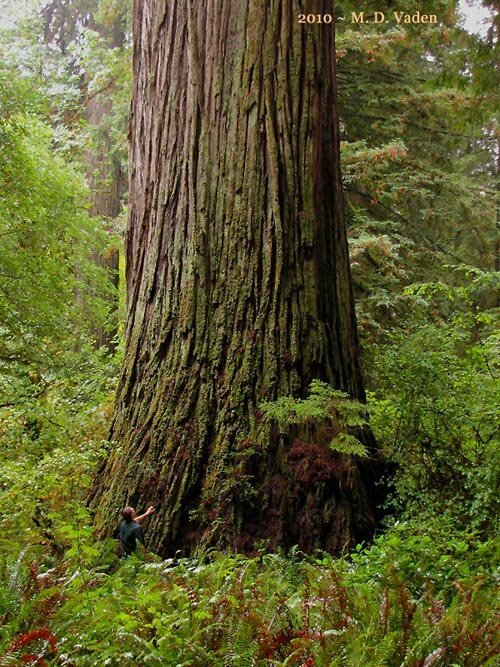 A large and very old redwood tree with unusually shaped growth next to the trunk. Ever had any friends in the window cleaning business who told you that glass is really a liquid, and slowly flows over decades or centuries. Even historic buildings like churches have thicker panes at the bottom. So is this true? I’ll get back to that. The tree in the photo is a very old coast redwood near the Grove of Titans. Can you see growth alongside the left side of the trunk? It does have a sprouted stem on top of it, and its not apparent if some part of it was a dangling branch at one point in time. But its laying to tight against the main trunk to be just a branch. 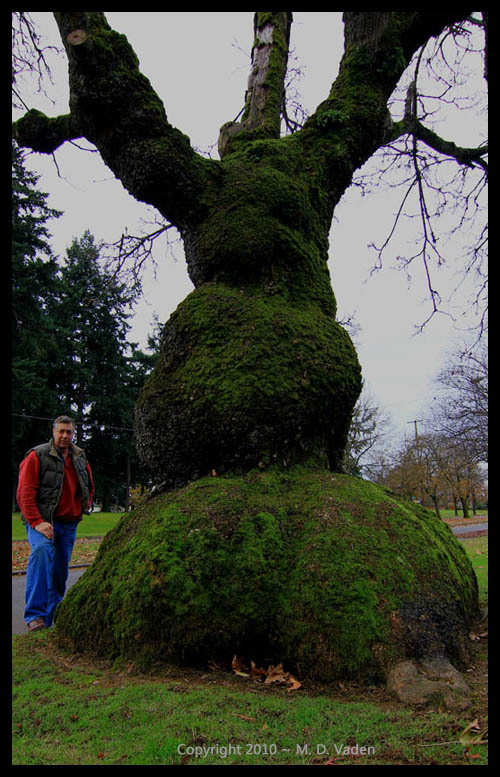 In some ways it looks like a growth sometimes referred to as a lignotuber, more so than a burl. Whatever you want to call this, and however long it takes, it does not flow, and there is nothing liquid about the state of the wood tissue. It’s all a matter of cell division and growth, but sort of unusual compared to many we see along the trail. Likewise, glass is not a liquid, but is solid. Glass is generally classed as an amorphous solid rather than a liquid, having all mechanical properties of a solid. In historic buildings, the antique glass which is centuries old, was made by glass blowers who spun glass, causing the edges to be slightly thicker. It did not flow thicker at the bottom of the panes over time, it was made that way. The thicker edges were intentionally put at the bottom of the frame to reduce water or condensation accumulation around the lead. And a few pieces have been found where the thicker edge is up, and the thinner edge down: likely an oversight or carelessness back in that day. In the redwoods, if you have not seen this kind of unusual growth before, slow down a bit when you hike and look at a few more redwoods. Glance deeper into the forest and see what you can find.